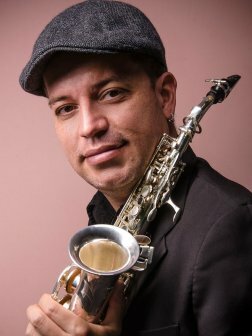 With over 15 years of experience, Manuel Obando V. is a renowned saxophonist in his native Costa Rica. From childhood, his concern was to perform, talents and gifts God gave him. For this reason, from an early age he became involved in the music, which led him to be part of several groups, including one cutting gospel called "Follow Me" band that was linked for many years. Their participation and recognition enabled him to travel throughout the country, allowing scenarios presented in popularity as the Melico Salazar Theater and the National Theater. In addition, the instrument has led him to travel extensively: most of the American continent (throughout North America, Central America and most of the South American territory) and the Caribbean, countries like Aruba and Dominican Republic. His experience has earned him also participate in music recordings of various artists, in styles such as ballad, Latin, popular. All this could not but lead to the creation of a company of musical services to execute varied instrumental music, covering lots of rhythms and musical styles with contemporary themes, includes jazz, bolero, pop, ballad, Latin, among others (with an emphasis on English music of the 70's, 80's and 90's). In the past year, large companies and corporations nationwide have been related to "Smooth", such as the Nation Group, Grupo Roble (Multiplaza), Square Itskatzu, hotels Barcelo and Occidental Hoteles ( "La Condesa"). Creating own musical productions and the elaboration of books that provide a dynamic mood with personal seal are two of the projects that will leave the imprint of this multifaceted musician and entrepreneur.